They will only conduct practice in VFR Conditions, however all they need is 2000 ft AGL. Which means there is a possibility that they could be conducting practice in VFR, while IFR traffic is arriving in the area. However, if we are on an IFR flight plan, your controller should be able to tell us if there is traffic in the area. NOTE: Military Aircraft will be squawking 0400. It is certainly OK to ask controllers if any Military aircraft squawking 0400 are in the area. We did some radio testing. I was in our Bonanza with one Garmin 430 Com, and two older King Radios. CHARLIE BROWN could hear me on the Garmin Com, but not on the KING radios while on the ground. However, I was unable to hear them on any radio while on the ground. Therefore if your radio is strong enough, you can make a blind call and they will hear you, but you will not hear them response. An airborne test will be conducted at the next possible time that they are active, and I am flying. But Capt. Hoover feels like once we are even 25 ft AGL, we should be able to hear them, and receive alerts. KBAZ will do their best to REPORT on the ATIS when the field is active. The AUX personal will call them as they become active, and then we they inactive. BUT KBAZ will only change the ATIS on the typical hourly basis, therefore, if you hear that the AUX is active, then it IS, but if you don’t hear it is active it STILL COULD BE. 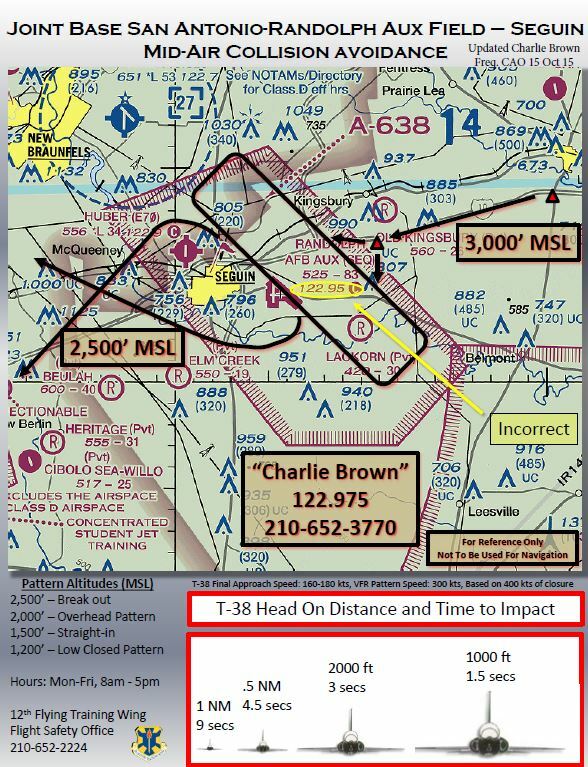 BEST PRACTICE: If you are flying in or out of Huber Airpark M-F 8:00-5:00, CALL CHARLIE BROWN at 210-652-3770 to alert them to your arrival or departure. If they don’t answer, they are not active! If they do answer, you will feel better knowing they are looking out for you! Friday both my dad and I separately had flights in and out of Huber while the Aux was ACTIVE. Here is what we learned! As suspected the KBAZ ATIS did not reflect that Charlie Brown was active, but that is because the ATIS came out before the hour and they went active at 12:01. The next ATIS did reflect that it was Active. So I call the Charlie Brown phone number at 12:05 and they answered and I gave them the heads up that I was departing runway 34 in 5 minutes to the WEST, SouthWest. Then I took off, by the time I was over the departure end, at about 100 FT AGL, I called them back, and they answered me with traffic advisories. They let me know they had one in a close pattern and that it was no factor. On our return to Huber, we called them 10 miles out with our position, they replied with no one in the area at that moment. About 10 minutes after our landing, we did see one jet fly just to the East of the field.. so now we knew they were active again. My dad took off and did the same thing: called them in the blind in position on the ground, and again once the gear went up.. he was able to hear them and get traffic advisories. It worked very well! The key : let them know where you are and where your going, and they will stay clear.